A thought-provoking reassessment of religious faith and progressive politics from an author whose “wonderful writing is both a surprise and a relief” (Naomi Klein). 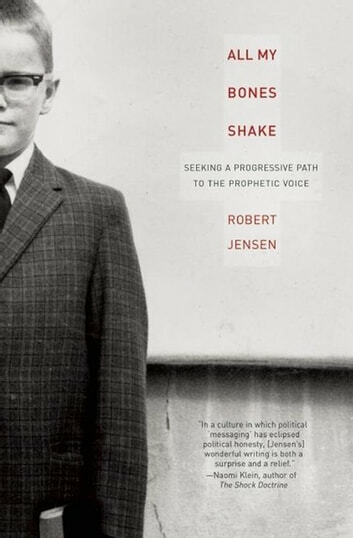 In All My Bones Shake, author and political activist Robert Jensen sheds light on the spiritual unrest at the root of our nation’s current political, economic, cultural, and ecological chaos. While popular media has reduced the issue of faith to a talking-heads debate between atheists and believers, Jensen shows the conflict to be far more complex. While fundamentalists on both sides have fought to an intellectual standstill and moderates seem content to ignore the battle, Jensen pushes for a progressive approach to theological questions, offering a path of faith that doesn’t negate the modern scientific world or threaten the rights of marginalized people. More than a simple study of the religious debate in America, All My Bones Shake marks a new communion: a way to use theology to create a sustainable society and meet the uncertainty of our lives with confidence.